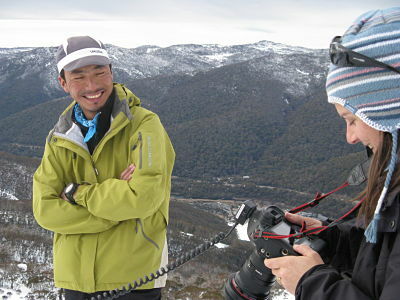 In 2009, Pemba Dorje Sherpa, holder of the world record for the fastest climb of Mount Everest, and environmental lawyer and activist Prakash Sharma, from the NGO Pro Public Nepal/ Friends of the Earth Nepal, journeyed to Australia to talk about the impacts of global warming on mountain regions in the Himalaya. Their stories were sombre – global warming is already having a big impact on Mount Everest and the Himalayas. Glaciers are melting creating floods and danger for the local people. But the big melt also means a big dry as these ‘water towers’ of Asia lose their capacity to provide water to the giant rivers in the summer months. Eventually rivers like the Ganges in India and the Yellow River in China will lose their dry season flow and the billion people in these river basins will lose their water security. They toured from Melbourne to Brisbane, speaking at public forums, doing media interviews, meeting with aid and development organisations and politicians and building links between affected communities. During the tour, Friends of the Earth released a report called ‘High Stakes – Climate change, the Himalayas, Asia and Australia’. As a keen climber, Pemba Dorje was hoping to get out into the back country and we organised a trip to Mt Kosciusko. Pemba has decided to make an attempt at the ‘seven summits’, an ascent of the highest peak on each continent and Kosci was an easy tick on his list. He had a photo shoot at the top station at Thredbo with a photographer from The Age newspaper, then headed off for a good wander around the main range, including taking in the summit. After much dawdling and side trips, we managed to miss the last chair ride down, making for a long walk back from Eagles Nest to Thredbo in a snow storm, and a late night drive back to Canberra for his next appointments. He never stopped grinning the whole time …. There are some additional images here. For details on the Big Melt tour, check here.